Fall is a funny time for chickens. It’s the time of year when you head out back and find yourself wondering when the pillow fight was and why you weren’t invited. Despite their worrying appearance your chickens are fine (maybe not the one muttering “braaaaains” but the others are good). When the weather gets cooler and the day length begins to shorten chickens begin their fall molt. 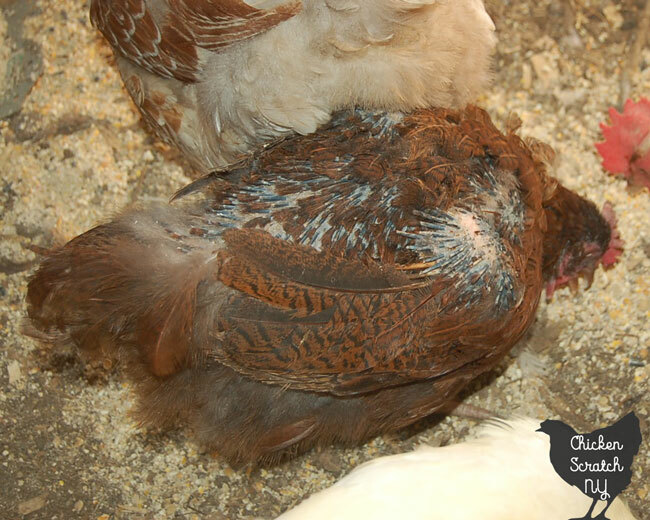 What is a Molt and Why do Chickens Molt? Molting is when the old feathers fall out and get replaced with nice new ones. It’s chicken shedding. It happens just in time for winter when they’ll need the extra insulation fresh new feathers can provide. Some chickens are more elegant about this than others. I have hens that do it so subtly you barely notice. Two of my Brahma ladies never look a bit disheveled, I only notice they’ve molted when they show up with fancy and clean foot feathers. On the other hand I have a handful that seem to drop all their feathers at once and wander around looking diseased and quite unattractive for weeks at a time. 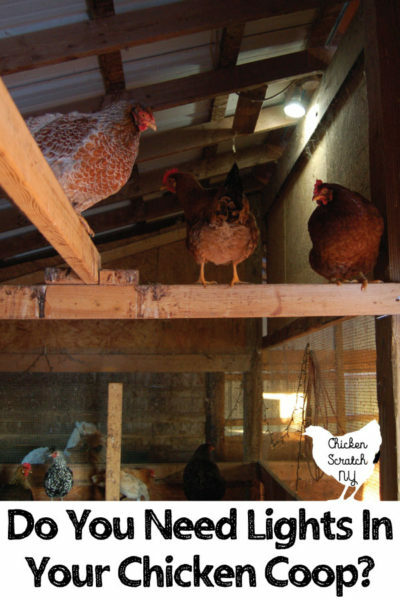 Both ways are normal and you’ll see your chickens fit anywhere between the two extremes. Hens will also get bald patches due to.. attention from the roosters. If the hens are molting you will see the new feathers grow in, if it’s rooster related they’ll be sporting bare skin that usually looks red. What Should I Do When My Chickens Molt? You don’t have to really do anything. 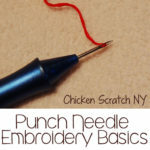 It’s a good ideas to keep an eye out from any broken blood feathers. Feathers are very fragile when they grow in and they can bleed a lot if they get broken or damaged. If you need a brush up on your bleeding feather first aid check out my post on Broken Blood Feathers. It also helps to keep some Blu-Kote on hand to cover up any injuries. Expect any fresh eggs. Growing in new feathers takes a lot of energy and you should expect a drop in egg production for a while. It generally takes 8-12 weeks for the full molt to take place. 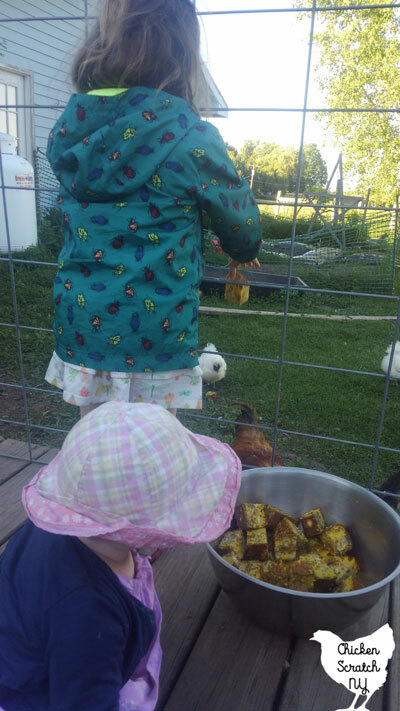 Which is a long time to feed chickens that aren’t laying. You can yell at them if it makes you feel better but they don’t care and they might poop on you out of spite. You should also avoid handling them, new feathers are pokey and uncomfortable. It’s also not worth risking damage to the new feathers. 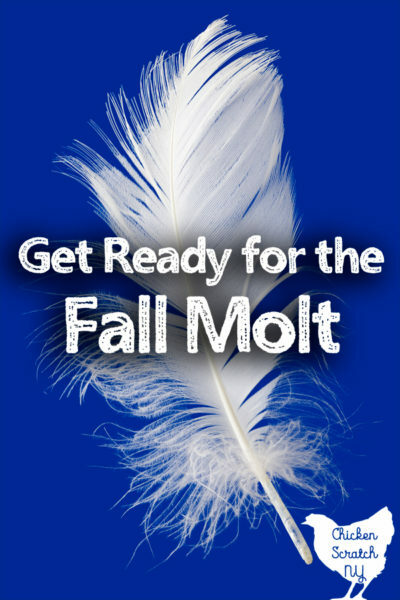 The yearly autumn molt can hit anywhere from late summer into early winter. There are also several age related molts and also stress induced molting. 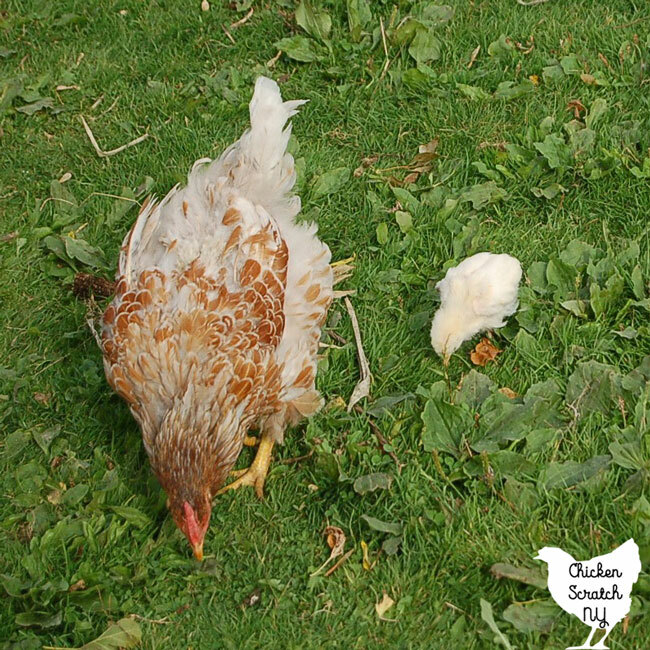 If you’ve ever started from baby chicks you know they only stay cute and fluffy little balls for about 10 minutes. Then the fuzz balls hit that awkward grow out phase where they get real feathers. Happens to the best of us. This year I ended up with two new Welsummer roosters, which I don’t actually mind so much. A fox got my good rooster and I’ve always been happy with my Wellie boys. 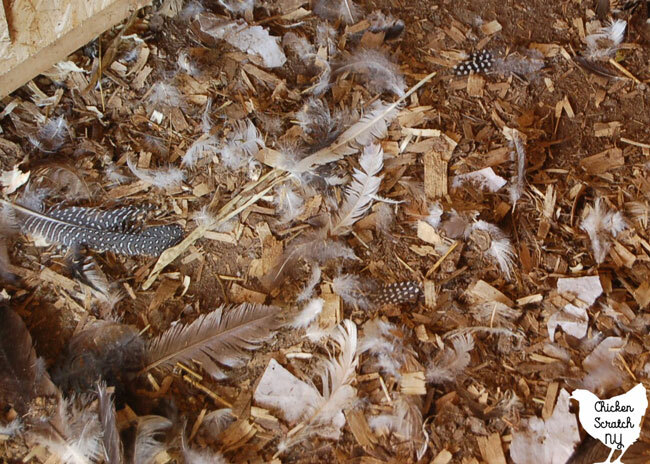 After they get their adult feathers your birds will molt the following fall, at about 18 months old. It’s not Fall, Why Are My Chickens Bald? Other than the time of year and the age-related molts we talked about above you can also see stress related molting. Extreme heat, lack of water and malnutrition can trigger a molt. Aprupt changes in lighting can also trigger a molt. I keep lights on in my barn during the winter to bring the day length from 6 hours up to 15 hours but I use a timer to keep things consistent. One more very common time for molting is after being brooding and hatching a clutch of eggs. It’s a bit annoying because it adds to amount of time your laying hen is out of commission but I consider a self-sustaining flock worth it. 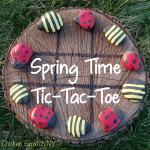 If you’re looking to spoil your chickens this is the time. You can switch from layer to a higher protein grower formula. I prefer to supplement with protein heavy treats. I like to make a giant egg loaf, I always seem to have a carton of eggs of a questionable age. We scramble the eggs and add in seeds and nuts and just about anything in the pantry that has gotten buggy. Cooked beans are good but never fee your chickens raw dry beans. If you’re carving pumpkins make sure you save the seeds and guts for the chickens! 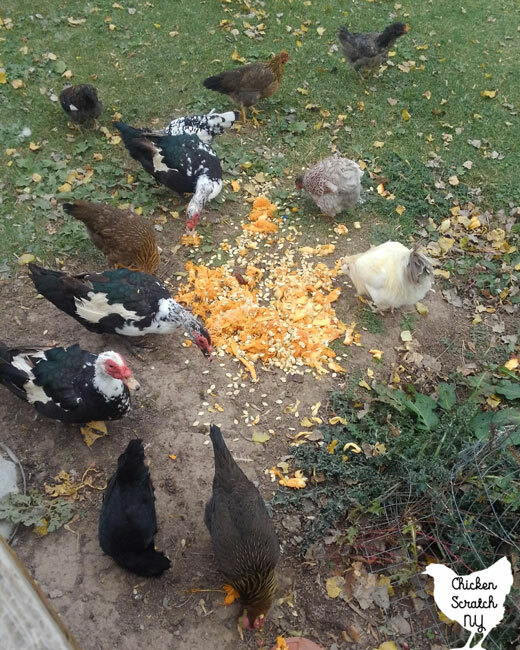 When we carve pumpkins at my moms I throw all the innards into bags and bring them home to my flock. 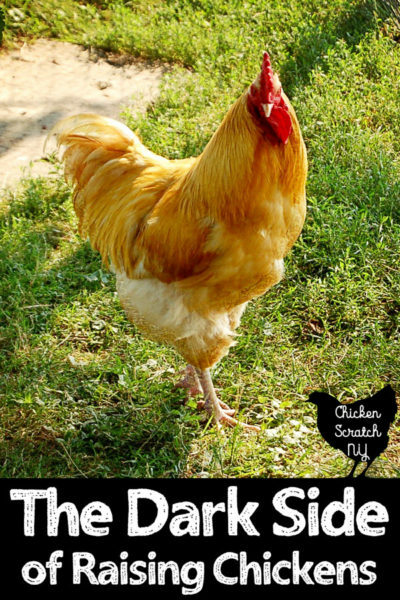 Don’t forget to PIN this to your Chicken or Homesteading board!